Across the political spectrum, Democrats, Independents, and Never Trump Republicans are resisting Trump’s destructive domestic and foreign policy, disregard for the constitution and the rule of law, likely corruption, and obvious incompetence. In contrast, the Republican Congress has not held the Trump administration accountable. The newly elected Democratic Congress will act as a constitutional check on the presidential power. New Jersey’s Blue Wave. 5 out of 12 congressional seats were held by the GOP. After the mid-terms 11 out of 12 seats went from red to blue. We won 4 seats and did not lose any. District 2. We won! Jeff Van Drew will replace retiring Frank LoBiondo. District 11. We won! Mikie Sherrill will replace retiring Rodney Frelinghuysen. District 7. We won! Tom Malinowski defeated Leonard Lance. District 3. We won! Tom MacArthur aligned himself with Trump. He was the only representative from NJ to vote for the Tax Cuts and Jobs Act of 2017, which raised taxes on many NJ taxpayers. He also revived the Obamacare repeal bill after it was declared dead in Congress. Andy Kim defeated MacArthur in a very close contest. District 4. This was one of the toughest district in NJ. Indivisible Monroe supported Josh Welle with donations and volunteering, including mailing, phone banking, and knocking on doors. We definitely put the incumbent Chris Smith on the defensive. At the end, Josh Welle outperformed all previous Democratic candidates, including in the presidential year 2016. Our path to victory was to get more votes than Chris Smith received in the 2014 mid-terms. Unfortunately, it was not enough, as Chris Smith had a higher turnout as well. District 12. We won! 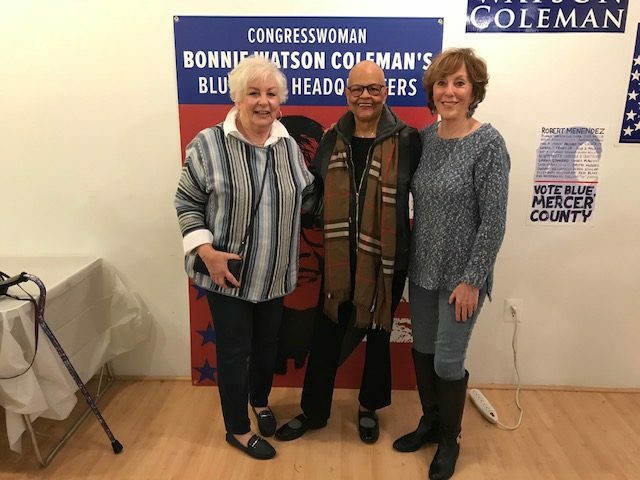 Our own congresswoman Bonnie Watson Coleman was re-elected. Senator Bob Menendez has been re-elected, defeating a Trump ally Bon Hugin.